Genoptix plans to develop clinical diagnostics for selected hematologic oncology indications in the U.S. using Bionano Genomics’ Saphyr System, the companies said today, through a strategic alliance whose value was not disclosed. Development efforts will focus on indications where detection of large structural variations of the genome is required for accurate diagnosis, Genoptix and Bionano said. The companies reason that since cancer cells typically show a large number of major rearrangements of the genome, their presence or absence can affect the characteristics of the tumor and its response to treatment. The alliance is intended to combine Genoptix’s oncology diagnostics and informatics services with Saphyr, Bionano’s high-speed, high-throughput genome mapping solution. 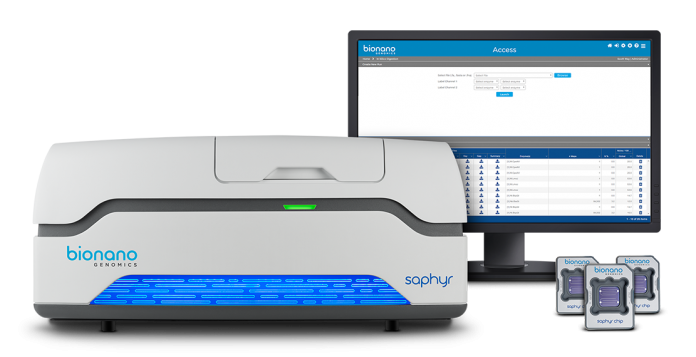 Saphyr is the company’s third-generation optical mapping solution, designed to enable visualization of whole genomes with long-range reads from 100,000 bp to megabase pair lengths. According to Bionano, Saphyr offers much higher resolution than available through karyotyping or fluorescence in situ hybridization (FISH)—as well as assembly and discovery algorithms that offer greater sensitivity than sequencing-based technologies. The company says its solution offers 99% sensitivity for large homozygous insertions/deletions, 98% sensitivity for translocations, and 87% sensitivity for large heterozygous insertions/deletions. Saphyr is one of Bionano’s two systems for next-generation mapping (NGM); the other is Irys®. Genoptix provides hematologists, oncologists, and pathologists with comprehensive testing solutions in hematology and solid tumor molecular profiling, and is among the largest hematopathology centers in the U.S. The company focuses on diagnosing cancers and disorders in bone marrow, blood, and lymph nodes, as well as in solid tumor workups using molecular testing. Novartis Venture Fund is among investors in Bionano, along with Domain Associates, Legend Capital, and Monashee Investment Management.